1,5 cm long not counting the ear hook . 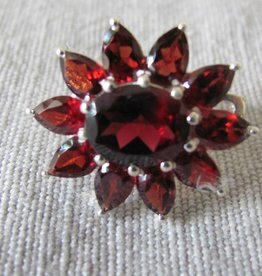 Oval hand faceted garnet surrounded by some very pretty detailing. Material is silver with an electroplated gold layer. Handmade silver earring from Jaipur India. 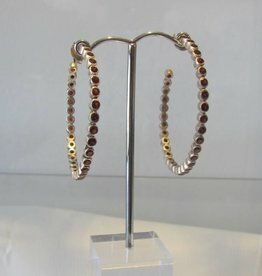 2 cm long excluding the ear hook.. Has two hand facetted garnet stones , one oval the other square. The stones are not set with silver behind to let light shine through them and enhance the stones working.